While on my honeymoon, I had a chance to go to a FIA GT1 race at the Navarra Circuit in Spain. 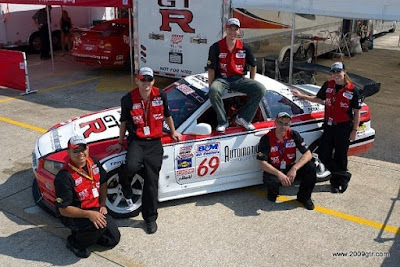 For the last few years, I have been involved with the Nissan GT-R, and I talk to a lot of people from around the globe. One day, fairly randomly, Andy Barnes from Sumo Power asked me if I had a chance I should attend a GT1 race. Looking at my wedding day, and the race schedule, Navarra Spain on July 2nd and 3rd sounded perfect. Andy put me into contact with a few people from his organization, and everything came together. Don't think this was only my idea as my wife is also involved in the automotive industry, and we met while racing a Nissan Skyline GT-R.
We flew into Madrid and had a chance to sight see, and visit several museums over the first few days in Spain. Everything can't be race cars and racing. At least not on your honeymoon. From Madrid, we took our rental Audi A4 TDI 2.0 liter, 6 speed, the 400 or so kilometers to San Sebastian on the northern coast of Spain. At 132 km/hr, the Audi has a speed warning, that dings at you once and then goes off. So you either want to maintain speed above 132 km/hr or below it. Since 132 km/hr is really not that fast, although the speed limit is 120 km/hr, its right around the speed I wanted to cruise. In San Sebastian, more old stuff, a port, an aquarium, lots more walking. Looking back into the town of San Sebastian from the port. This looks like a walking area, but you can drive and park here in the morning. We left San Sebastian on Friday, headed for the closest city to the track at Navarra, Logrono. On the way, we decided to stop by the track to check out any action, and try and pick up our credentials. Lack of Spanish, and a generally clueless lady in the office ended up with being a fail to get in on Friday. Everything seemed pretty slow, and mellow, not what I am used to on a race weekend. Even the local regional events get pretty busy. So we jumped back in the Audi and headed to Logrono. Saturday morning we headed to the track and met up with Simon Slade from Sumo Power. Sumo Power runs two GT-R's in, and JR Motorsports runs two GT-R's. For the FIA, teams are allowed a maximum of two cars, so even though all the cars are under the JR Motorsports banner, two wear JR Motorsports livery and two wear Sumo Power, and they are run as "separate" teams. JR Motorsport and Sumo Power run a large team. Four trucks, two car transports, one logistics, one for hospitality. Four race cars, eight drivers. Lots of crew. A couple of mechanics, car chief, engineer, data guy per car. Then overall team managers, Nismo guys for engine and car support, a press manager, cooks, people to take care of the hospitality area, etc. In other words, a lot of logistics to get the whole team moved to ten different countries over the eight month season. Coffee and Tea machine. Or should that be Tea and Coffee? The nice part of not having to work on the cars, was getting to fully enjoy the hospitality area, and also get up close and personal with the cars. The two Sumo Power Nissan GT-Rs shared a large garage space in the FIA garages. These differ from what I am used to in the US, as there is no pit wall dividing the pit lane from the cold pit. From the above picture you get an idea of what the FIA GT1 car actually is. It uses a Nissan GT-R "tub" or chassis, but most everything else is altered. Supposedly it shares about four parts with the Nissan GT-R you can purchase off a show room floor. Which four parts do you think those are? In the engine compartment, where you would expect to find a V-6 twin turbo engine, there is a V-8 5.6 liter engine as used in a Nissan Titan. 600 hp. The engine sounds fairly thumpy, but not lumpy. It sounds like it is a long stroke, low revving, without a lot of camshaft in it. It was one area where we were asked to not take a lot of photos, so we respected that request. Factory core support- modified is still in place. Under the hood, lots of carbon fiber ducting. The V8 seems to be pretty far back in the engine compartment. The radiator is at about a 45 degree angle to the ground. Another view of the engine compartment. Roll cage tie in to the upper suspension mounting points, and the reservoir's for the brakes and clutch master cylinder are visible. The GT-R's are all right hand drive. The wheel well has a lot going on. The nearly fully enclosed wheel well has ducting coming in from two places, with three ducts from the front of the car. The brake rotors have shields on them, so the actual friction surface is not visible in the above photo. In the front, 6 piston Brembo calipers clamp carbon brake pads onto carbon brake rotors. The car's use a single center lock lug on them for faster pit stops. All the suspension arms are custom fabricated with relocated pickup points as per FIA rules. Also visible behind the caliper are a couple of the fiberglass wrapped header tubes from the engine, on their way to the side exit exhaust. Left side, brake rotor shield off. The mounting points for the front suspension are visible in the above picture. The small black hood shock looking thing is a shock potentiometer. It is part of the data logging system, and reads the suspension position as the car goes around the track. This information is very useful in car setup and tuning the chassis. On each side of what appears to be a power steering cooler in the above and below picture are the ducts that are part of the front brake cooling. Airflow though the front of the car is managed with lots of carbon fiber, and orange ducting directing air. In the above picture, the upper grill is used for brake, power steering, and possibly engine oil cooling. The 1/2 smile is the ducting for the engine inlet air. The opening is fairly large, but the restrictor diameter is small. Behind the engine air inlet the radiator is visible, tilted forward at about a 45 degree angle to the ground. Each side of the radiator are the main brake cooling ducting. The rear brakes use a 6 piston Brembo caliper on a carbon/carbon brake setup. The brakes are well ducted, and the wheel wells are vented to release trapped air. Visible in the above pictures are the blade style end on the rear anti-sway bar, the front shares the same kind of mechanism that is a favorite of race cars. The anti-sway bar allows for several positions of adjustment to tune the chassis. Inside the car its all business. The driver is set back in the chassis for better weight distribution. Anything not needed for a race car is jetisioned overboard. The suspension on the car is nothing too exotic. No push rod in board suspension. No through rod dampers. Just some Sach's dampers, and suspension modified to fit the FIA GT1 rules. Checking toe with alignment strings. FIA GT1 runs a knock out qualifying session on Saturday. They start with the full field, and then pare the field down to determine the starting position for the Qualifying race. The Qualifying race is an hour long and counts for points, and for position, for the Championship race on Sunday. The Championship race is also an hour long, but it counts for more points than the qualifying race. The #21 Sumo Power car finished in fourth place during the Qualifying race after an outstanding pitstop, the #20 car had an electrical issue that caused them not to finish. This put the the #21 car in fourth place to start the Championship race. A miscue during the pitstop caused a few second delay, and the #21 car finish in third place, the #20 car had a drive though penalty and finished in 12th place. The #21 5.6 liter, 600 hp Nissan GT-R starting up, and warming up. Pit stop practice, with a full four tire change on Saturday morning. Wet tires to wet tires. Awesome pics and write up about the Jr/sumo power cars. Also congrats on the wedding!